Now, we are going to say here right up front that we all should know that Mad Dog means "kill" as in "murder" only if you are a GI carrying a rifle in a combat zone. I shouldn't have to say that, but given the age in which we live, it's important to emphasize that the General is speaking in a military setting, and his advice on "killing" is (or should be) obviously restricted to the combat sphere. But this is good advice - very good advice - far beyond the military setting. If you are intelligent and willing to accept this, shall we say, metaphorically, and accept as any civilized person should that "kill" in the ordinary everyday context of life means "triumph with extreme prejudice," then this, my friends, is the right attitude to succeed in life. No wimpy stuff here, you either succeed, or you don't. Failure, as the Marines say, is not an option. 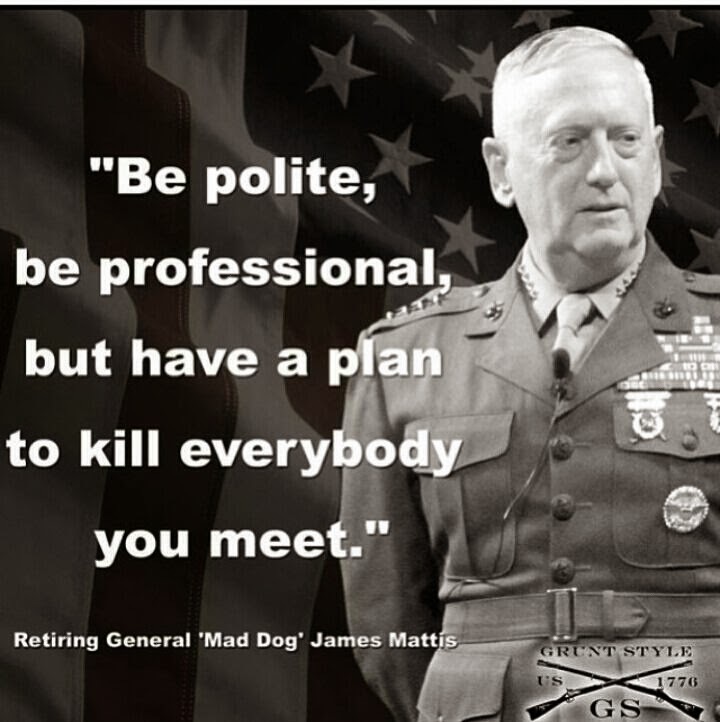 The most important takeaway from what "Mad Dog" says, though, has nothing to do with the "kill" part, though of course that is what gets your attention. Instead, the real kernel of truth is when Mad Dog says: have a plan. If you have a plan that works, you are good to go. If you don't you'll never succeed at anything. I have, or at least try to have, a plan every single day of my life. I often come up with it while falling to sleep at night or waking up. Those are absolutely, positively the best times of the day to plan the next day. I hope I have a little of General Mattis' spirit. Metaphorically. I hope you do, too.